The Ontology Based Data Access (OBDA) paradigm enables (1) a clean separation between a conceptual business view from heterogeneous data sources and (2) ability to ask questions in terms of the business view, independent of how and where the data is physically stored. Two key components are ontologies and mappings. Capsenta is applying the OBDA paradigm for Business Intelligence applications. Even though OBDA has been widely researched theoretically, there is still need to understand how to effectively implement OBDA systems in the real world. From an practical point of view, this begs the question: where does the ontology and the mapping come from? 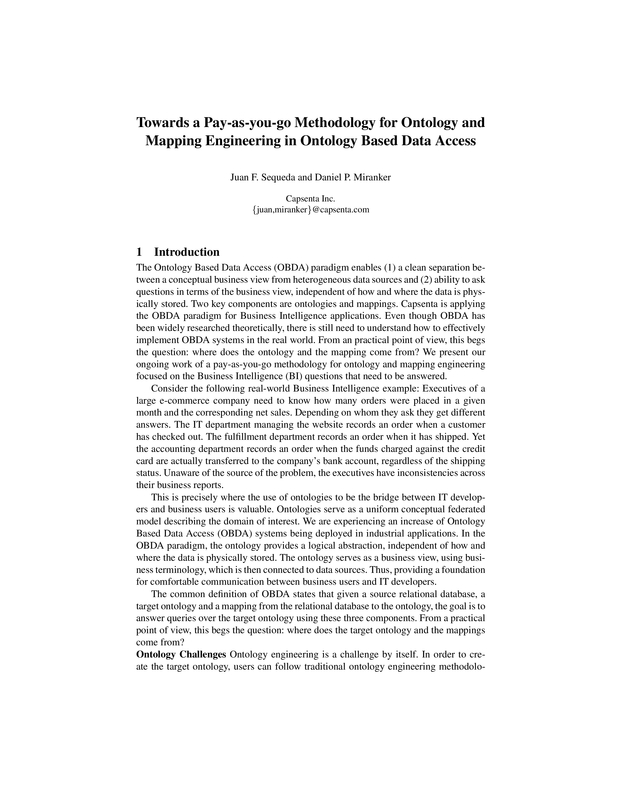 We present our ongoing work of a pay-as-you-go methodology for ontology and mapping engineering focused on the Business Intelligence (BI) questions that need to be answered.